We say yes to the hot weather in beautiful and unforgettable Wyoming. When we went looking for the best Lodging in Yellowstone National Park we were quite pleased to find Luton’s Teton Cabins were HIGHLY recommended. We first checked out Trip Adviser but then we found that Luton’s lets their guests post reviews on their website too and those were really cool to read. After checking out their website and getting a feel for their idea of lodging in Yellowstone Park we went ahead and booked our vacation. In addition to it’s close proximity to Yellowstone, the Grand Tetons were right out the back door! The sunsets alone are worth the trip. 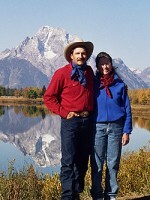 Moreover, Brad & Joanne Luton treat all of their guests like old friends. I guess that’s why you want to come back as soon as possible!